Before you can even start trying to guess who will win Album of the Year, you have to know who is eligible for the 2017 Grammys. The rules for eligibility are pretty cut and dry. According to the award show's official website, to be nominated, albums "must be released between Oct. 1, 2015 and Sept. 30, 2016." Back in June, the Grammys updated their guidelines, and now streaming-only releases are eligible for awards, not just physical releases. So, who will likely be hearing their names Dec. 6 when the nominees for the 59th annual Grammy Awards are announced? Adele's 25 missed the last Grammys — it came out Nov. 20, 2015 — but this time around, it's a lock for Album of the Year. The only question is, will she be able to outdo her 2012 Grammy performance? 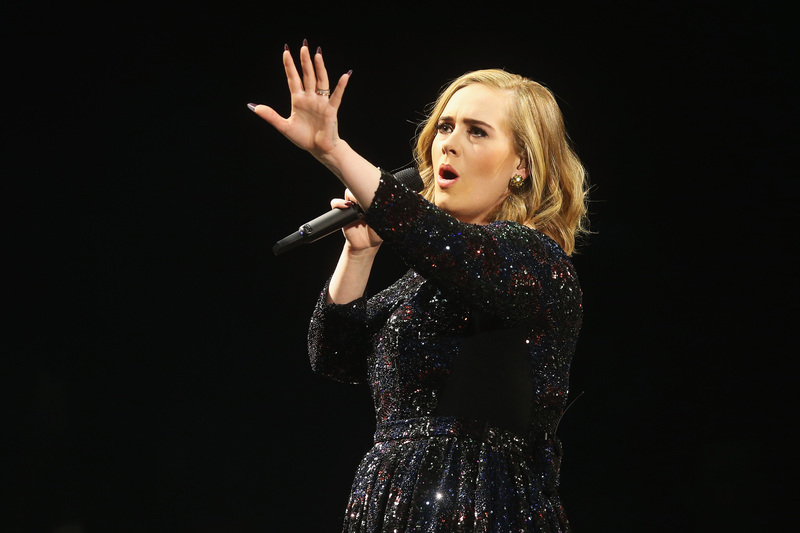 With 21, Adele picked up six awards, including Album of the Year. Adele tied the record for most Grammy Awards won by a female artist in one night, which was set by Beyoncé in 2010. Speaking of Queen Bey, Beyoncé's Lemonade will also have an opportunity to take home a lot of gold at this year's awards, airing Feb. 12, 2017. Most recently, she lost Album of the Year to Beck's Morning Phase (don't remind Kanye West), but still managed to take home three prizes. Beyoncé has won 20 Grammys in her career, making her the second-most winning female artists behind Alison Krauss, who has won 27. But, it's not just these ladies who will likely be duking it out for Album of the Year. West's The Life of Pablo, Radiohead's A Moon Shaped Pool, and David Bowie's Blackstar are all eligible. Not to mention, they have been very well-received by critics and fans alike. Other albums that may get called on nomination day include Chance the Rapper's Coloring Book, which was released digitally in May, and 2012 Best New Artist winner Bon Iver's 22, A Million, which was released on Sept. 30 of this year. Sia's This Is Acting, Rihanna's Anti, and Justin Bieber's 2015 album, Purpose, are also eligible. Solange's A Seat At The Table also dropped before the deadline, which means the Knowles family may be doing a lot of celebrating next Tuesday. There are other artists that may get some love in the song categories including The Chainsmokers, Desiigner's "Panda," and Lukas Graham's "7 Years." The Weeknd's album, Starboy (out Nov. 25) may have missed the cutoff, but his single of the same name is up for eligibility. As is Justin Timberlake's "Can't Stop This Feeling." Zayn Malik's "Pillowtalk" and his album, Mind Of Mine, could also be nominated, though Billboard says the former One Direction member is not eligible for Best New Artist. According to the Recording Academy's rules, Malik doesn't count as a new artist because he released four albums with 1D, the biggest boy band in the world. Sorry, Zayn. Drake's Views has had a big year, and it could get even bigger once the Grammy noms are announced. His fourth release, released back in April, became the first album to reach a billion streams on Apple Music. His single "One Dance" is also the most streamed song in Spotify history. But, don't expect "Hotline Bling" to get any bling. According to Billboard, the track was not submitted for consideration by Drake's people, so it will have to settle for being the Song of the Summer in 2016. Unfortunately, there are some other big pop stars who won't be up for this year's awards show like Lady Gaga, who's most recent album, Joanne, missed the cutoff. Another release that will be surprisingly left off the ballot is Frank Ocean's Blonde. According to Billboard, the album, which came out on Aug. 20, is ineligible because it was never submitted for consideration by "Ocean's labels, management or other reps." The same goes for his visual album, Endless, which was also released a month before the cutoff date of Sept. 30, 2016. Billboard reported that it was unclear whether this was intentional or an oversight, but sources close to Ocean's team said it was a conscious decision to not submit the project. In 2013, Ocean's Channel Orange was nominated for five awards and won two, including Best Urban Contemporary Album and Best Rap/Sung Collaboration, for the album track "No Church in the Wild." But, hey, for all the others who missed the deadline, at least there's always next year.